There is now another freely downloadable app in the iTunes AppStore called TB Mobile. If you have an iOS based device and any interest in research for new tuberculosis drugs, you should check it out. The app presents about 700 molecular structures, each of which has been screened against the tuberculosis mycobacterium (Mtb). The app owes its existence to a grant from the National Institute of Allergy And Infectious Diseases, headed by Sean Ekins, who is representing Collaborative Drug Discovery (CDD). Recognising that useful curated data such as was produced in this undertaking has a way of winding up in a silo that most people don’t know about or don’t have access to, Sean decided that the best way to ensure that the results are disseminated to as large an audience as possible would be to turn it into an app, not unlike the Green Solvents app that we produced awhile back. Under the aegis of CDD, my company (Molecular Materials Informatics) was commissioned to produce the TB Mobile app, starting with the iOS platform. 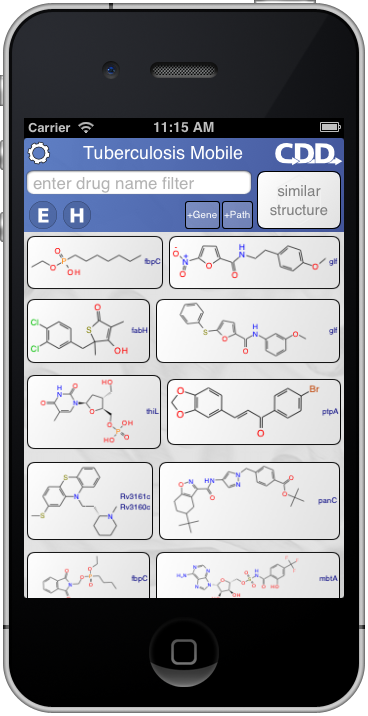 The app itself has a strong similarity to the Approved Drugs app, which is no coincidence, since it is built on the same framework, as it has a similar objective: present a catalog of molecules on the front page, which can be browsed or searched by various criteria (text, structural similarity, or by applying various filters that are specific to the content). Each of the molecules can be tapped on for more detailed information, which in the case of TB Mobile, is the specifics of how the molecule is known to interact with the biology of tuberculosis. For more detail, see the press release and blog from CDD, or just download the app. Additional credits go to Malabika Sarker of Stanford Research Institute for data curation, and Barry Bunin and David Blondeau for making it happen on the CDD end.